This brilliant iPAQ Screen Protector is an high quality silicone based screen protector that leaves no air bubbles or sticky residue like many of the cheaper screen protectors when applied or removed. This iPAQ screen protector is designed to be reused time after time, just wash in warm soapy water dry and reuse, it really is that simple. Due to the perfect contact the screen protector creates with the iPAQ touch screen it actually improves the feel and responsiveness of the touch screen when being used with the stylus. 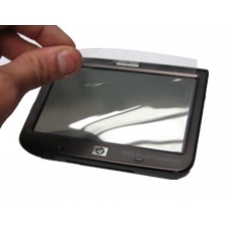 This is the perfect overall solution for protecting your iPAQ screen from dirt, scratches, grease and finger prints.